Please, do not skip over this post because of its Scientific nature. Read it very, very carefully, and then read it again. It’s easy for guys like me to be saying all along that CO2 is not contributing to Anthropogenic Global Warming/Climate Change. When a Scientist comes along with an absolute proof, then it really is time to sit up and take notice. Water Vapour is the largest of the Greenhouse Gases, and is 51 times greater in total than all the CO2 on the Planet. Take this simple Global Warming test and carefully read each page of responses. For years now, we have been told that science is dedicatedly attempting to find out how the Earth’s Climate works. With all possible seriousness, the most publically vocal of these scientists, those working for the UN’s IPCC (Intergovernmental Panel on Climate Change), have for the last several years blamed the warming they “found” on Carbon Dioxide. With the release of the CRU (Climatic Research Unit, University of East Anglia) e-mail database, it is very clearly apparent that the scientists involved with the IPCC were doctoring data to give a specific result. That result was designed to look as if CO2 was causing climate change, warming the earth due to human activities. It can be reported now that this theory has been solidly disproven by Dr. Ferenc Miskolczi, and his work will make history. To give context to this discovery, a short lesson in science is needed. The term “Constant” is very well known in science. Simply put, it is a part of an equation (an equation is merely a mathematical sentence, the Variables are the words) that does not change; they are specific and represent solid concepts. You may have heard of Bohr’s Constant, Hubble ’s Constant, Avogadro’s Constant, there are many of them. There is a new Constant; one that has not been named, but if history is any guide it will be called the Miskolczi Constant, named for the physicist who discovered it. A Constant we are all familiar with is the speed of light. Before Einstein and his famous theory of Relativity E=MC(sup)2, it was widely believed there was no limit on speed – just throw a rock from a speeding train and the speed will continue to add up. Einstein and his theory of Special Relativity put a specific limit on speed – the speed of light, beyond which nothing could go. There is a strict energetic limit, and we have recognized that for decades now. Before Miskolczi, it was generally thought that the greenhouse effect could be increased infinitely by adding more and more CO2 molecules into the air. Under the conditions prevailing on Earth, Miskolczi has proved that there is a limit to the greenhouse temperature that cannot be raised. Why is that? The IPCC has been telling us the exact opposite for years. Simple, because just as with Einstein’s E=MC2, there is a strict energetic limit, as the Miskolczi Law proves. Dr. Miskolczi’s Constant was discovered with a program that is the result of a project started 25 years ago in Hungary. It was then he began the process of writing a high-resolution radiative transfer program which would describe the Earth’s climate using the TIGR Global radiosonde archive of the Laboratoire de Meteorologie Dynamique, Paris database. With this information he was able to accurately describe mathematically how the atmosphere absorbs and releases heat using a long standing Equation called the Schwarzschild-Milne transfer equation to accurately calculate the Earths infrared optical depth. That is what Global climate is; the process by which Earth either holds onto or releases heat. The IPCC and the CRU scientists would have us believe that CO2 increases the heat the atmosphere holds on an infinite unlimited basis. That conclusion is absolutely false, and the CRU and the IPCC have had to falsify and invent data to make it appear that it does. In reality, water is so overwhelming abundant on Earth, it dominatingly, completely, and overwhelmingly governs the climate equilibrium of the Earth. It is 71 percent of the total surface area of the planet, 333 million cubic miles (a cubic mile is an imaginary cube measuring one mile on each side) of water exist here, by far outweighing all other greenhouse gasses. Can our climate undergo changes due to the addition of greenhouse gasses? Yes, but only under circumstances great enough to overwhelm the presence of 333 million cubic miles of water, such as the impact of a large asteroid and the tremendous heat it would add in an instant. Carbon dioxide is very far inside the greenhouse effect’s self-regulatory barriers. Amounts even double our current emissions, cannot overwhelm this equilibrium. Only the Sun has that immense amount of power, and only water exists in quantities large enough to effect such a change. 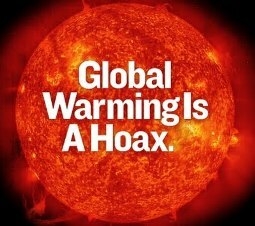 As long as the sun’s activity is the “business-as-usual” fluctuations and there is water on Earth, CO2 cannot cause or increase global warming. In order to correctly understand why this is, it is necessary to recognize that what is important here is the equilibrium between the incoming energy from the sun (heating) and the outgoing longwave (infra red) energy (cooling). The 40 percent of the planet that is not cloud-covered at any given time allows for solar radiation to be absorbed at the surface. The most effective form of cooling is the evaporation of water, which takes heat energy from the surface and puts it into the air. Clouds form, which do three things: 1) create more cloud cover reflecting solar radiation away from the planet which also 2) release heat into the very high upper atmosphere where it is also radiated out into space as the clouds condense into precipitation, and 3) drops much cooler water back down to the surface cooling things even further. This is an oversimplification for the sake of brevity and clarity, the interactions here are very complex as is the equation which describes it. However, this does not change the simple fact that our planetary climate system is at equilibrium, and the Miskolczi Constant allows science to completely describe that equilibrium. For the first time, we can do so accurately with raw data, and match observed data with the results. No “hide the decline” is needed when simply describing reality. Let’s get more basic in dismantling the IPCC’s “theory” of climate. If one takes Earth’s greenhouse gasses away, the planet would be about -18 degrees C (4 Degrees F) on a global average. Add in the greenhouse gasses and their influence back in using the Miskolczi Constant and you get a 33 degree C increase to approximately 15 degrees C (59 Degrees F). This value is constant, and maximized on a global scale. It also matches observed data. Raw data, not manipulated or computer processed data. Using Miskolczi’s law and constant, there is no need for manipulated data, only the real observations, and that is the reason this discovery is so significant. If you double the amount of current CO2 emissions and add that to the equation, and you cannot come up with the 35 to 38 Degree C increase that the IPCC and Al Gore have been preaching about. It is physically and mathematically impossible, and thanks to the Miskolczi Law and Constant, provable and repeatable by scientists the world over. Dr. Miskolczi first published his work in the Quarterly Journal of the Hungarian Meteorological Services in 2004, Volume 108, No 4. He published further statistical proof in the same Journal in 2007, Volume 111, No. 1. In the five years since he first published his results, not one peer review has come back disproving his theory, or his Constant. To date, not one scientist has come forward to disprove Miskolczi’s theory that the Earth’s climate is at equilibrium, and that Carbon Dioxide cannot be released in amounts great enough to upset that equilibrium. In short, according to Dr. Miskolczi’s discovery, Earth’s temperature will not rise or fall as a result of increasing CO2 emissions because of the inherent equilibrium created by our oceans upon oceans of water. This discovery is proof that the IPCC has been lying to the world, along with the CRU and other agencies which have been pushing for programs such as Carbon Cap and Trade schemes. That scheme was designed to coerce peoples and governments into handing over tax dollars for the UN to manage and redistribute as it sees fit. Carbon Dioxide emissions cannot cause Global Warming. Government agencies, including the U.S. federal government and the White House, continue to push this issue as a prelude to instituting a Cap and Trade Tax scheme here in the United States, and it is based upon fraudulent science. A segment of the scientific community has had its credibility usurped for what amounts to fraud and embezzlement, and indeed went along willingly in order to continue to receive funding for their grant programs for decades. In other words, they “produced” predetermined results according to what the check writers wanted to see in order to keep their jobs. Their own internal e-mails prove that. That’s not science, which describes reality as it is. That is science fiction, and should be condemned as the fraud that it is. The American government, and governments the world over, should be prevented at all costs from instituting Cap and Trade Taxation. Reducing carbon emissions, taxing them into oblivion, will not alter the Earth’s climate in the least. It will however beggar this nation, and every other nation which institutes it, and have no effect on the climate at all. Author’s note: Are Drs. Miskolczi and Zagoni being silenced about this theory? FamilySecurityMatters.org Contributing Editor Dianna Cotter is a married mother of three, and a Golden Key International Honor Society student at American Military University.